Feel the rush … team lockout before stage 1 is mid morning Tuesday Australian time. Here is your some last minute information to pick your teams. My strategy article has taken a bit longer than expected. But I’m on the ground in Adelaide and have done a lot of research. Lets get into it. Lockout is mid morning Tuesday Australian time. Last year Simon Gerrans won by 1 second over Cadel Evans. This year the race should be tight again. There are only 6 stages, and 2 hilltop finishes to separate the contenders. The TDU has an important difference to many other races – riders get bonus seconds for placings in intermediate sprints and at finishes. So riders after the GC win will have to ride at the front of the peleton, rather than just somewhere in a big bunch that all gets the same time. So ideally we want riders who are good enough climbers to stay with the lead selection, but still have enough zip to be at the front for intermediate sprints and the final dash to the line. Marcel Kittle is the dominant sprinter in the race, and he has the best leadout train. If he gets to a finish he should win. However, last year he won the prologue and then was unsighted after that. He just couldn’t stay with the leaders – sometimes finishing 10 minutes behind. My feeling is that if he gets dropped, he will stay dropped. His team won’t continually put themselves into the hurt zone this early in the season for a relatively inimportant race. And no-one else will help them. It was important to win the prelude for their new sponsors, and for Kittel to show his rivals he is in form. However, his support teamates were obviously struggling at the end of that race after only a short high speed chase. If Kittel gets dropped I think a couple of riders will stay with him to keep him safe at the back. But then Giant will let Tom Domoulin ride for GC/stage wins, rather than try to bring Kittel back. We should be able to pick good squads of riders for this race. Many of the most expensive riders are not here, so we probably won’t need many really cheap riders and can have quite deep squads. Twelve trades should also be enough as the terrain doesn’t change dramatically, until stage 6. Make sure you save some trades for that final urban crit sprinters race. Click on the various profiles to make images bigger. The feature of this stage is the Checkers Hill KOM. The climb is short but steep – average 9%, peaking at up to 20% near the top. The peleton will fracture on the climb and the leaders will charge for home from that point. It is still 28km from the finish, but it is rolling with some tight bends. In my view Kittel will get dropped on the climb and miss the finish. He might even be dropped before as 25km/hr crosswinds are forecast. The first stage is important as the winners also get points for being initial jersey leaders as well. This stage has the same finish as last year – the 3 laps of Stirling with the uphill finish. The climbs at the start are different and somewhat difficult, but they come so early they are unlikely to be decisive. We should see a decent break though – taking intermediate KOM and sprint points. I expect a large group will contest the finish with sprinters who can go uphill taking it out. Again I doubt Kittel will be there. This is an interesting stage. 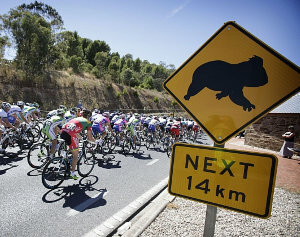 We should see a fast pace – sprinters will want to contest the 3 intermediate sprints and teams with GC riders will be trying to keep the break on a tight rein. Then there is a very steep climb up to Paracombe for the finish – expect GC contenders to come out to play here. Again Kittel won’t be in the finish, and he rarely contests intermediate sprints. This should be a sprint finish and it would be a chance for Kittel to win. However, the Fleurieu Peninsula stages are often wind effected causing big splits. A 20km/hr southerly winds is forecast for Friday and my expectations will be there will be wind splits in the peleton and Kittel will be in rear group again. Expect to see an early break featuring contenders for the KOM, and eventually a large group sprint between those who are alert and organised enough to stay at the front. This is the stage where the final GC battle will be played out. There is a long flat circuit followed by 2 climbs up Willunga Hill. A breakaway group will pick up the intermediate sprints, but then the final finishing points will all go to GC contenders. Stage 6 – King William Road Circuit, 90kms. A city street circuit but more difficult than the prologue. There is a small hill at the North Adelaide end and a 180 degree bend at the southern end. So again Kittel might find it tough. The GC jersey will have been decided, but those in contention for other jerseys should make the race. My advice is to avoid Kittel as he won’t make many finishes. Also I would avoid Porte before stage 3 as I don’t think he will ride near the front enough to pick up fantasy points for us. – Tom Domoulin, Mick Rogers. I think Evans and Porte will not come into consideration until Stage 3. The code for the DTTalk ProCycling League is 75482, this is a private league but any number of players can ask to join. There is also a race tracker app for your mobile so you can keep track of your riders in the race. ProCyclingStats.com is the best site to research the abilities and historic performance of various riders in the TDU startlist. Just click on any riders name and you will see their performance history. I had Kittel in my team for being the best sprinter but was worried as he didn’t really do much last year. You’ve convinced me to dump him for someone else. No Kittel, even tho the bookies had him as favourite. So 1 to me. Didn’t have anyone in the break, but feel vindicated somewhat in my prediction that the peleton wouldn’t catch the lead group over the KOM, even though it was nearly 30km. I drove that gorge road yesterday … it is very windy and rolling up and down, it is hard for a big group to organise and maintain a high speed chase over that terrain. Well the racing was good and I had a great time at the TDU. I think the fanstasy game was good in that there were some good options to pick every day. Plus its always good to see the cheapest rider Wouter Wippert take out the final stage. Unfortunately we were let down a bit by the game organisers having made so many changes and then having a few bugs. The mini-leagues have become a bit pointless if they are adding multiple games together and some players aren’t playing each of he games (i.e. standard, purist, aussies). But I think seanheavo’s Porte Power won our league and was 7th in the world which was a great effort. Just counting the standard game I think I came 2nd in our league and was 34th in the world – 45 points behind. I got down to single digits twice on stage scores (a 2nd and an 8th) which I was happy with, although I never really recovered from the shocker I had on stage 1, scoring only 40 points. If anyone comes back to read this .. I plan to run a league for the Spring Classics this year that run in March/April. The good thing about these is they are all one-day races usually about a week apart and you can change the whole team for each race. So we won’t be in the continuous scramble mode that happens with a daily stage race. I think SBS will be showing some of them live on TV also which will be good. Congrats to Porte Power for being 7th overall. Top effort! I think I was a little put off with the changes they’ve made. I’ll play a few more games during the year but it looks like I’m limited to 8 games total as I won’t be paying for the premium membership. I’m down to 6 games left, minus TDF, Giro, Vuelta which I’ll probably also play. Yes Gorillas .. in the DTTalk mini-league they added the standard race comp and aussies comp scores together … which is nuts since some players didn’t play both games. Because they did this they also stopped us clicking on other players in our league’s scores and seeing what they had for each stage (another step backwards). But do you think TDU standard and aussies counts for 2 games not 1? Is that why you are down to 6. Seems bizarre to call it 2 games when they then add the scores together. Yes, I just checked my account and it says I’ve joined 2 games so far and I’m down to 6 left. I’m hoping they’ll fix a few of the bugs (especially the scoring) and it will get better.